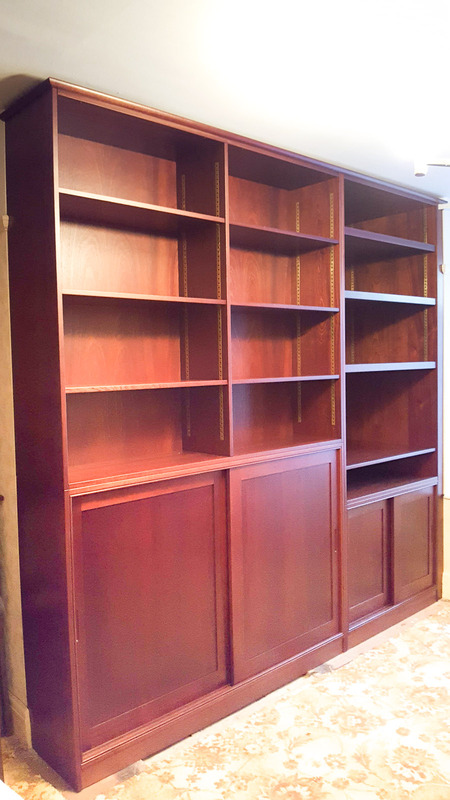 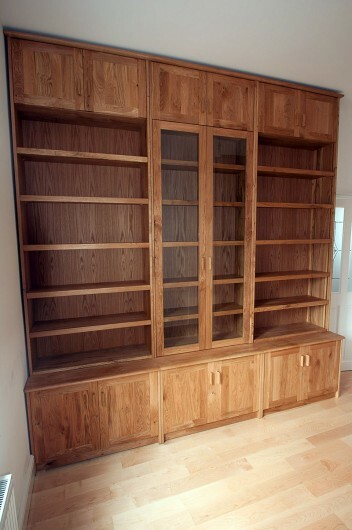 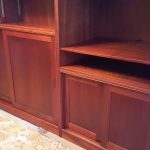 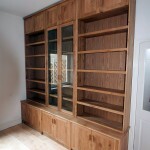 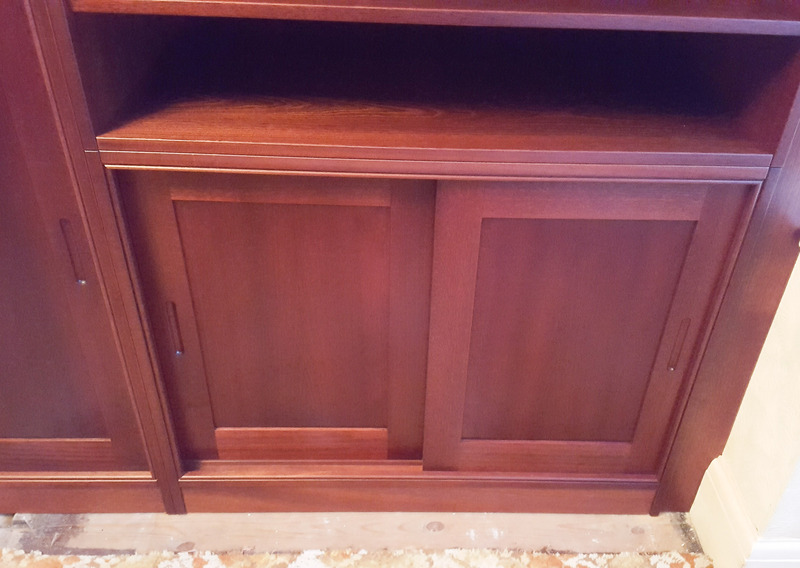 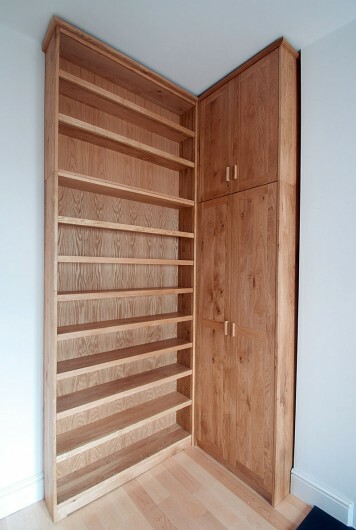 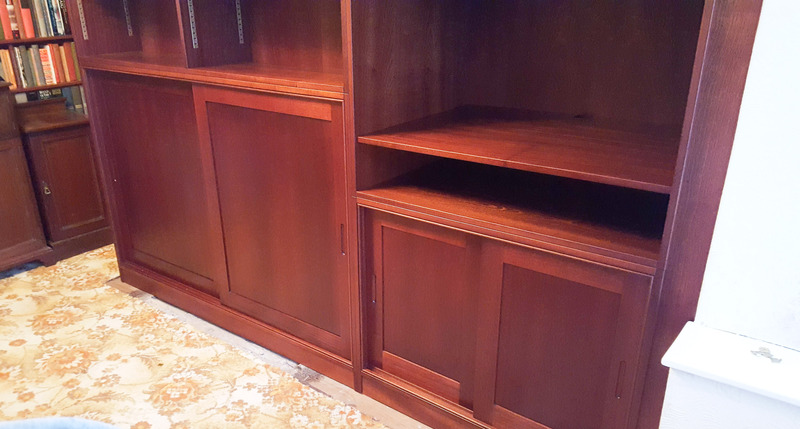 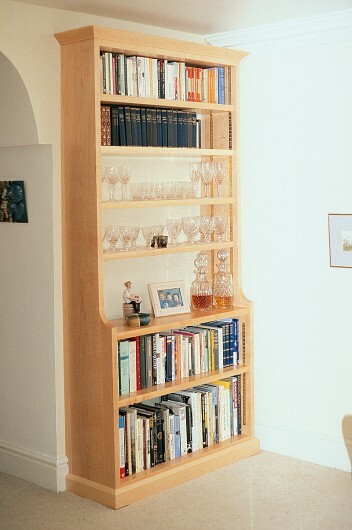 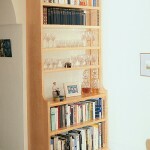 Built-in bookcase and cupboards in solid Sapele with sliding doors and fully adjustable shelves. 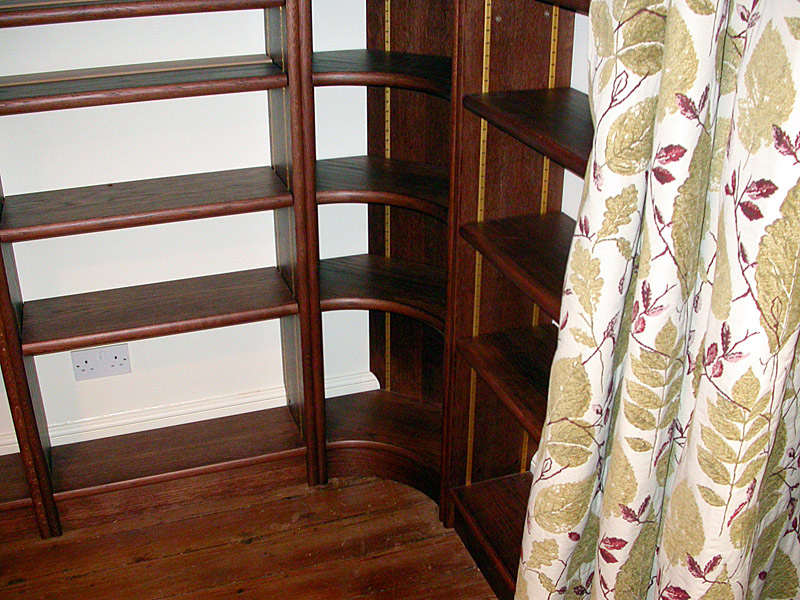 Stained timber to match existing furniture and a semi-mat lacquered finish. 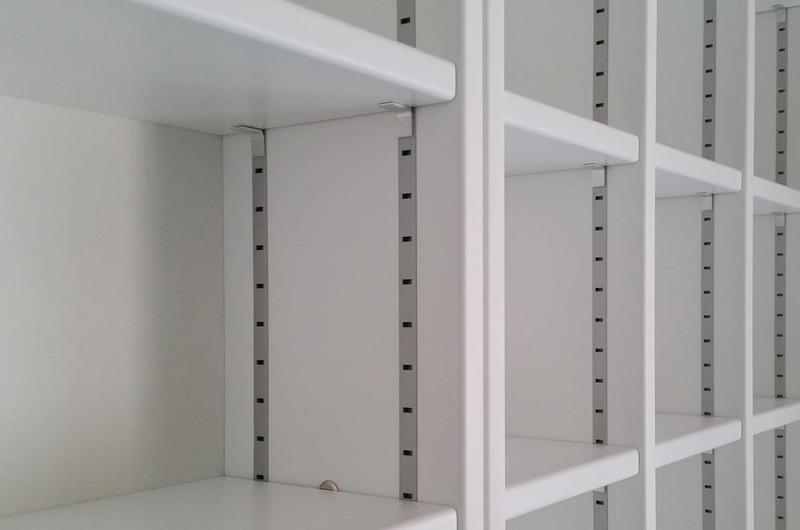 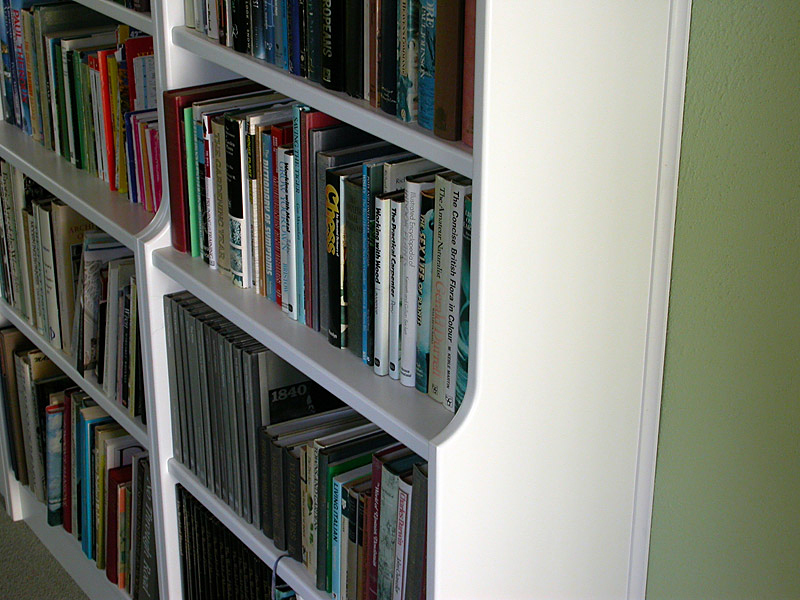 These white painted bookcases have fully adjustable shelves for versatility and are finished with a super smooth white mat lacquer, which is practical and hard wearing. 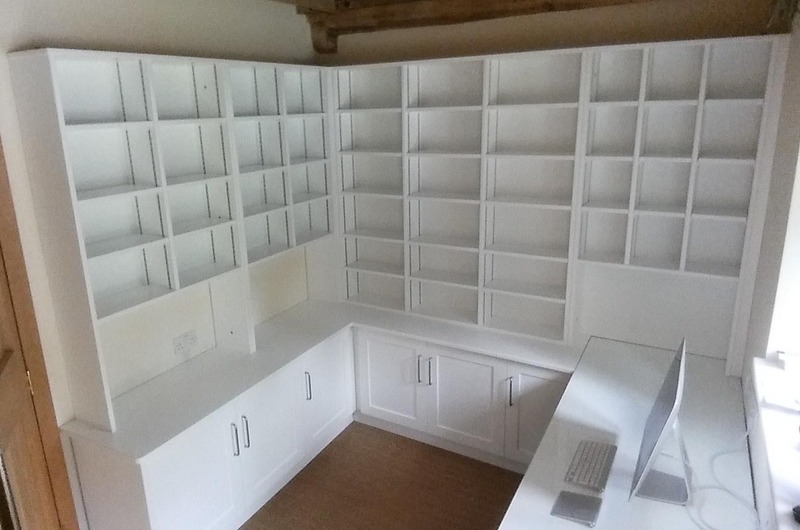 This commission was for a small study in listed barn conversion where we needed to maximise the shelving area as well as providing worktop space for printers etc. 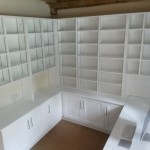 The brief was to have a glass worktop for the desk area, which we achieved by overlaying the white surface with 6mm toughened glass. 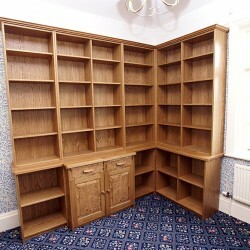 Corner bookcase with adjustable shelves made in oak. 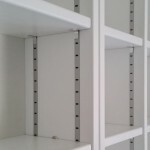 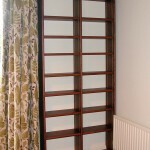 All the shelves are mounted on fully adjustable bookcase track for complete flexibility. 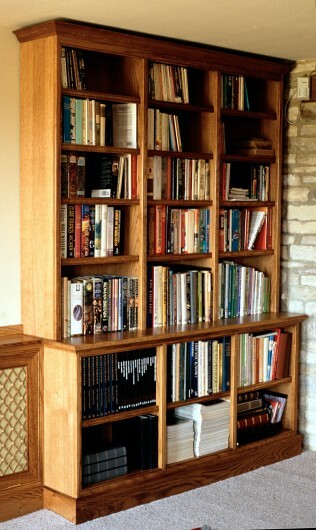 The corner section is a nice feature, maybe not so good for books but great as a display area. 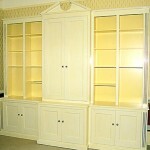 We made this in such a way that it can all be taken apart for ease of delivery as well as future flexibility. 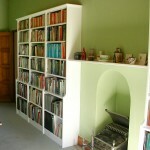 We often get asked to make bookcases with painted finishes and here are a few examples. 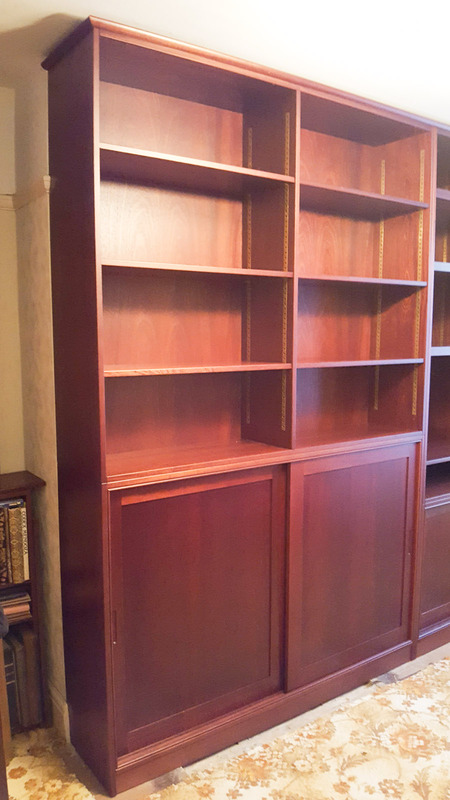 Shelves are fitted on adjustable bookcase track, which makes the whole thing versatile and flexible in accommodating different book sizes. 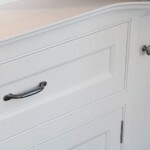 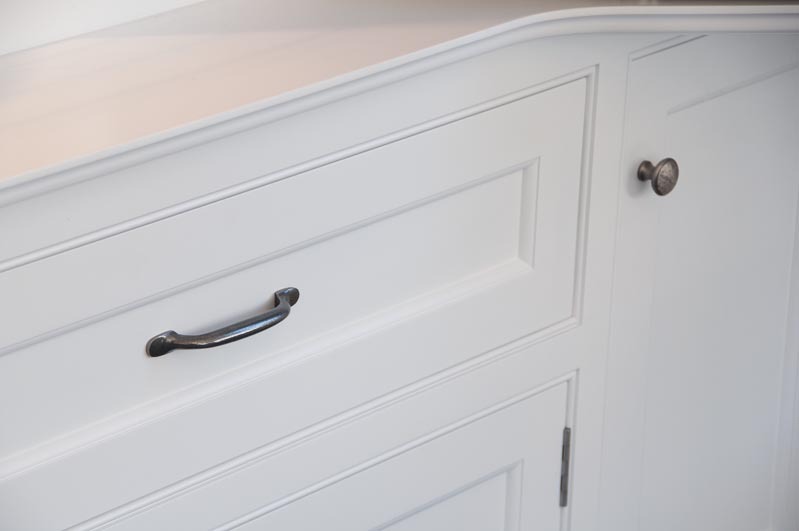 The white sprayed lacquer is a favourite finish being practical and hard wearing and can be done with mat, eggshell or gloss sheen levels. 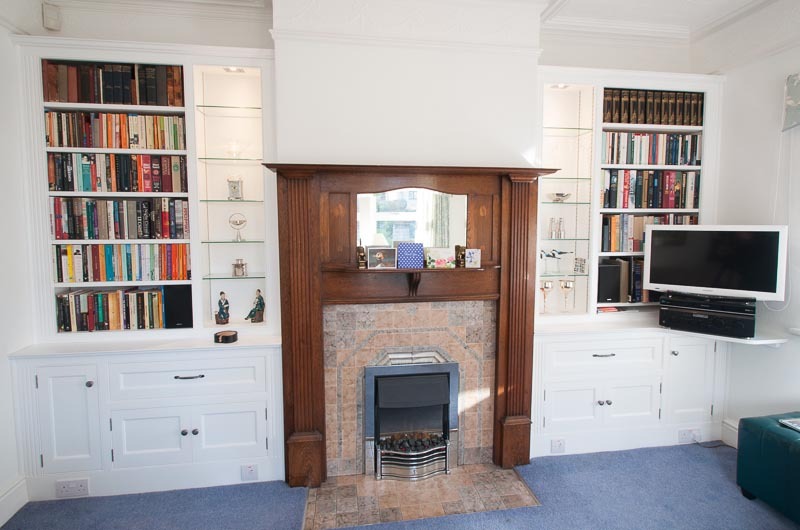 The built-in bookcases with the cabinets below are detailed to reflect the style of the 1920’s fire place with fluted frames. 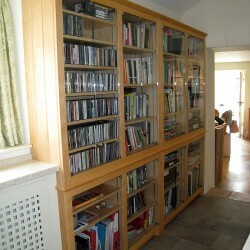 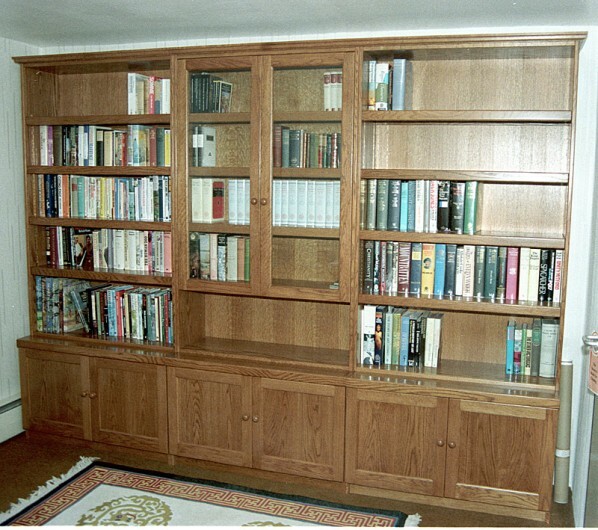 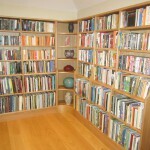 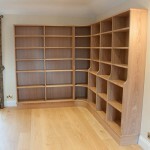 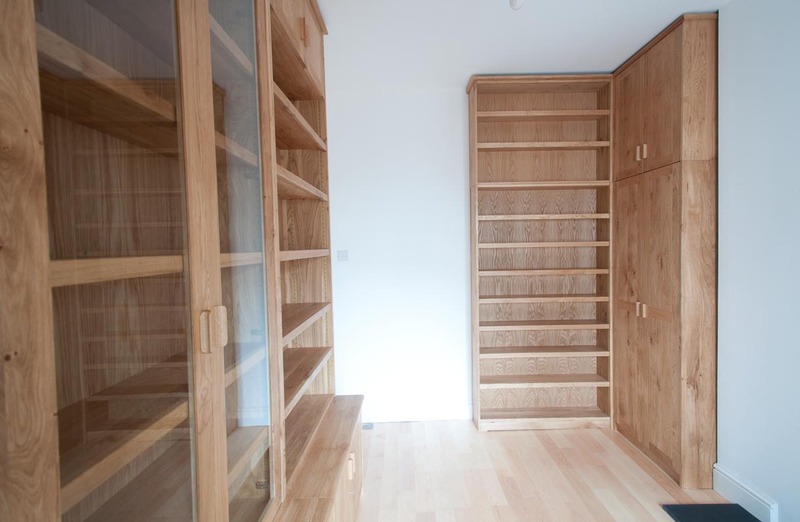 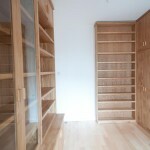 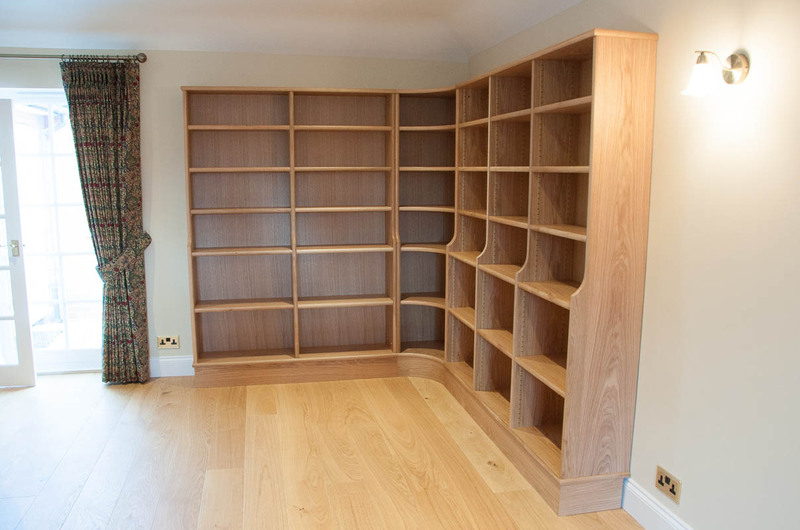 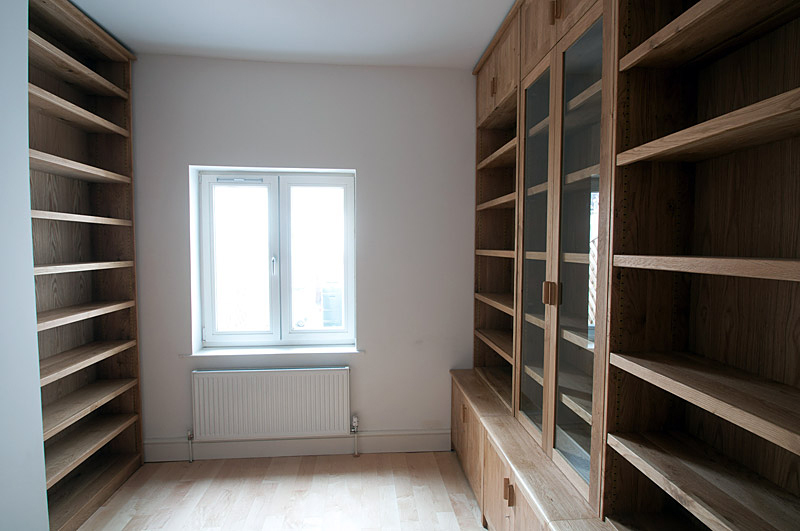 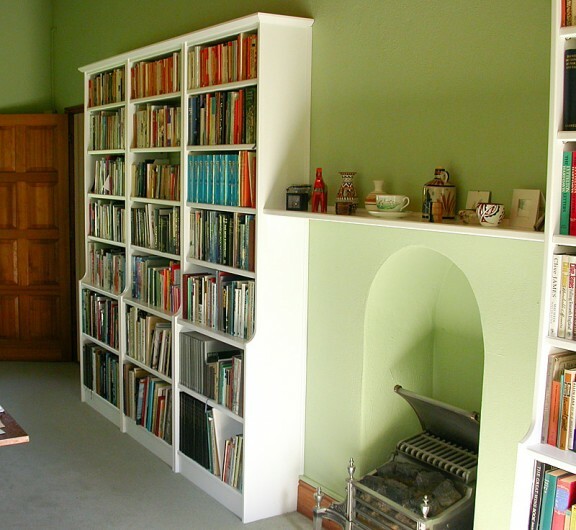 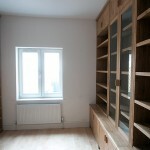 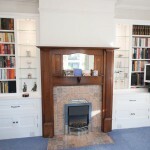 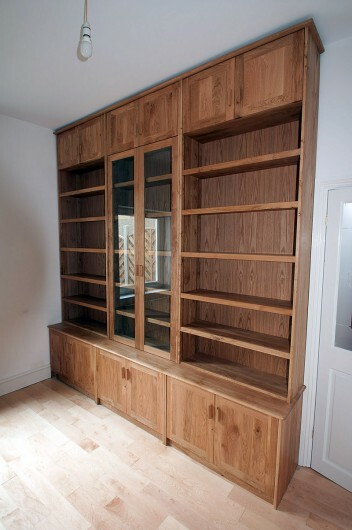 We fitted this room out with solid Oak library shelves and cabinets, pretty much wall to wall. 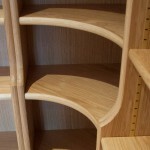 As always the shelves are all fully adjustable. 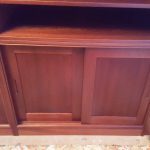 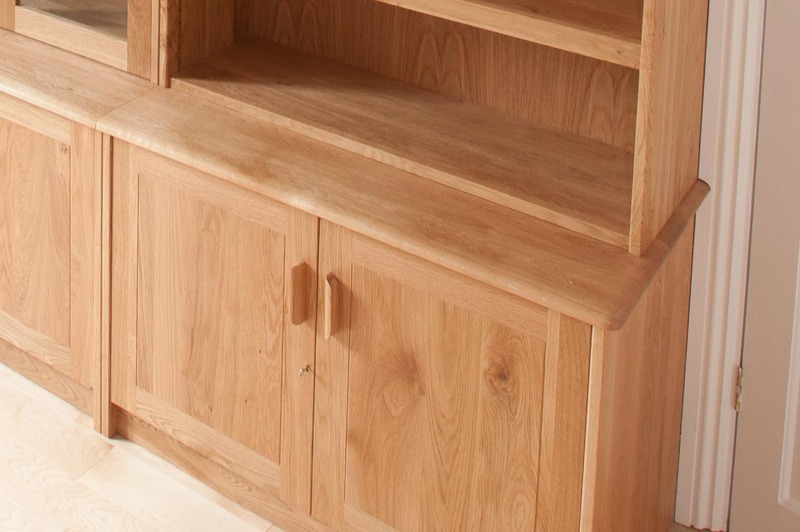 The cabinet doors have solid oak panels but more unusually they are flush on the fronts, making a very smooth and streamline style. 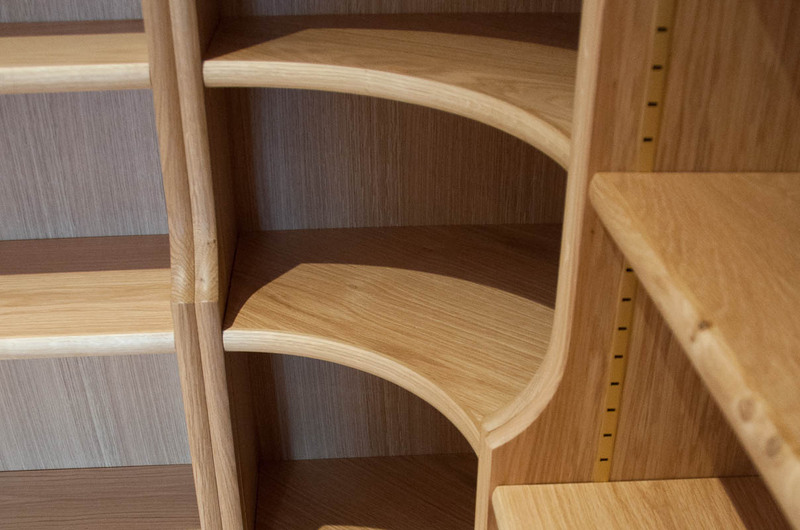 Everything is finished with Rustins Danish oil, an old favourite, which will allow the oak to mature to a rich warm colour. 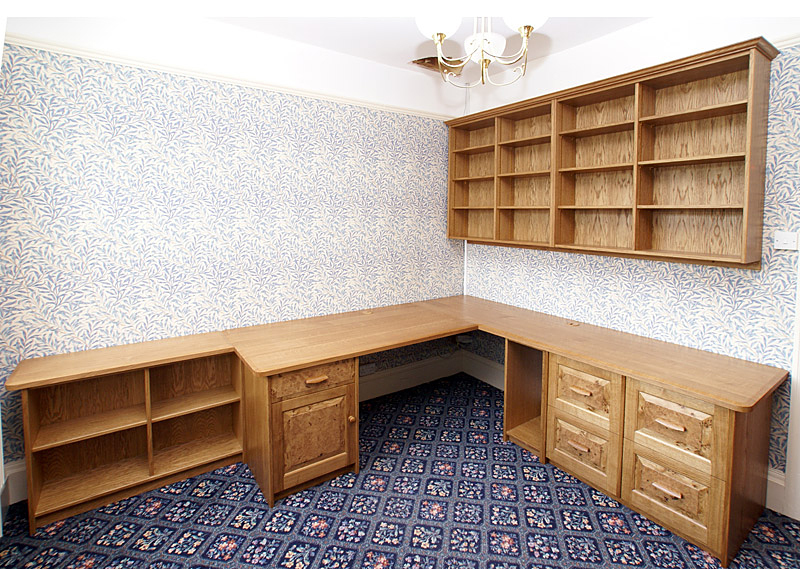 This just goes to show what you can do with a small room. 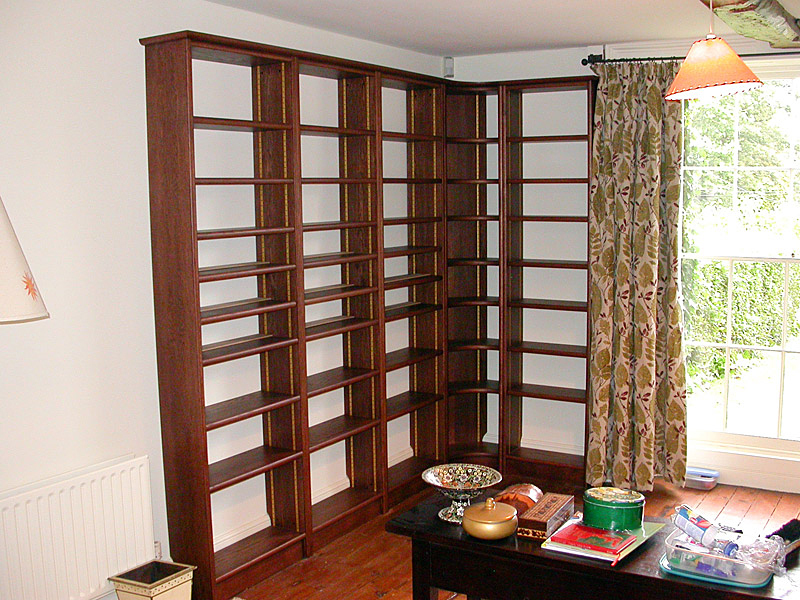 Study bookcases with a natural colour finish. 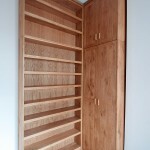 The door panels are Burr-Oak. 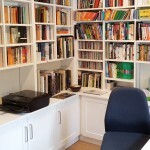 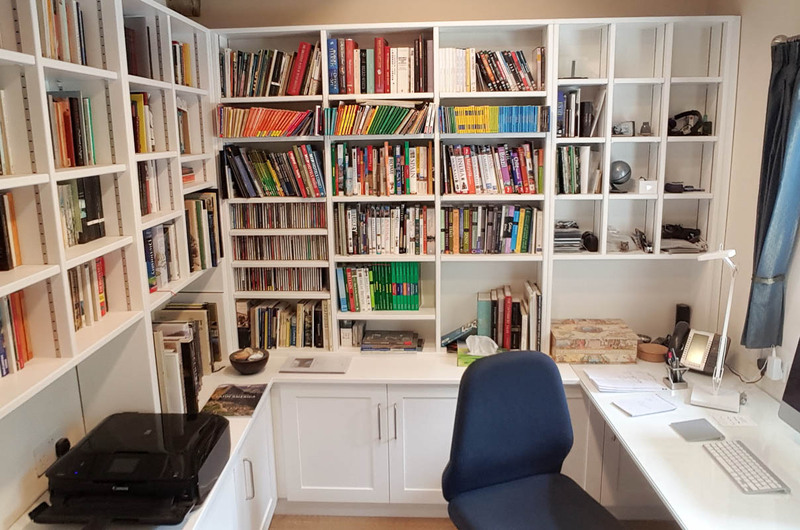 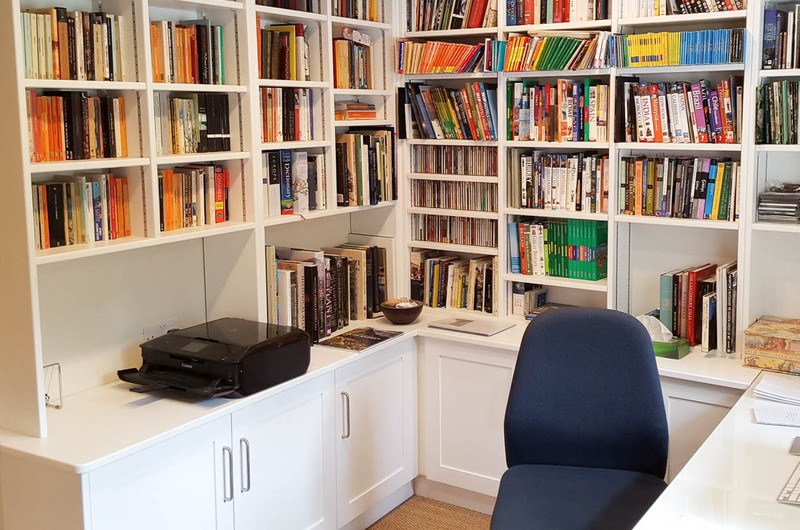 It looks a bit stark here without all the books but this job was a great success, creating a very practical but elegant study area with masses of bookshelves a large desk area and plenty of filing drawers. 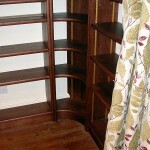 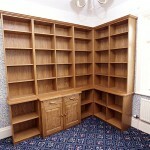 Dark Oak bookcases with a corner unit. 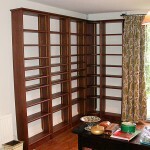 All the shelves are fitted on adjustable bookcase track. 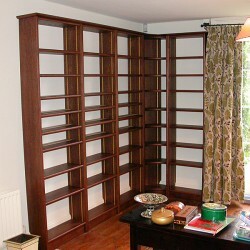 What a magnificent breakfront bookcase (sorry about the poor quality of the photo). I think this was the first breakfront bookcase that we made and with a broken pediment too. 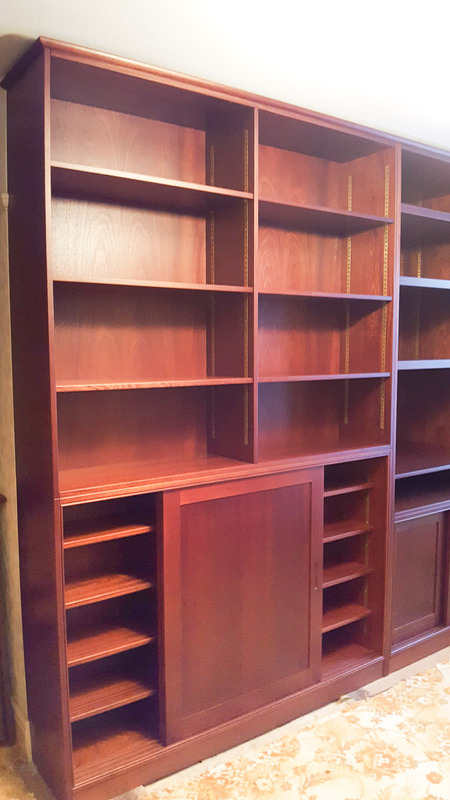 Although it was a large piece it broke down into 6 separate cabinets making it easy to install (and to move in the future). 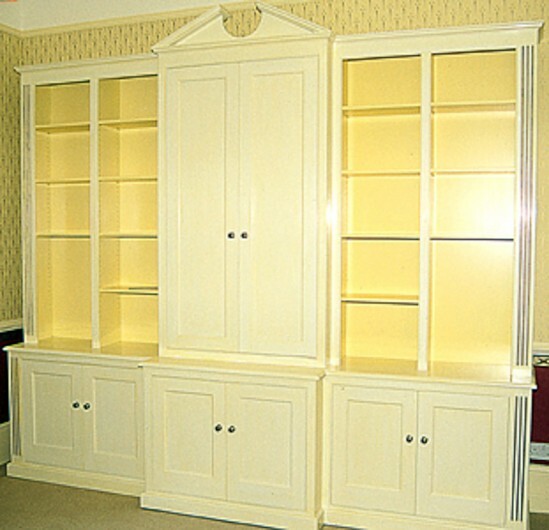 The finishing took ages as it was hand-painted with a light colour-wash effect and then finished with a protective varnish coating. 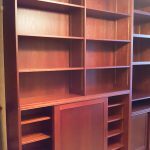 Since then we have made other breakfront bookcases in different styles and finishes each one, as always, designed for a specific location and the result of careful collaboration between ourselves and the client. 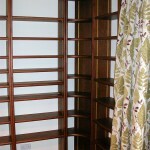 A breakfront display cabinet designed for a collection of Staffordshire pottery. 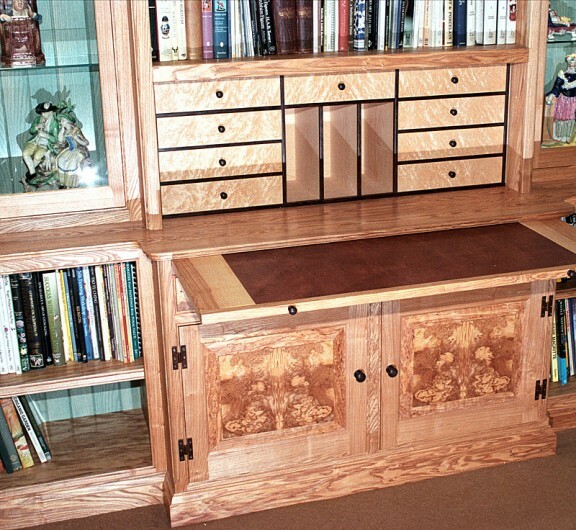 The timber used was Olive Ash and the very decorative door panels Burr Olive Ash reminiscent of the famous Rorschach inkblot test, what do you see? 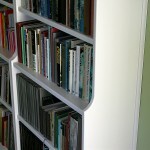 The centre section of the breakfront housed a pull-out desk surface with a leather writing surface. 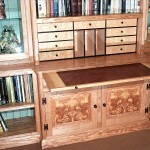 Birds-eye Maple was used for the little drawer fronts above the desk and they were framed with the very dark Wenge. 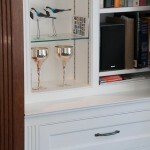 The interiors of the display cabinets were finished with a pale blue-green colour wash as a backdrop for the pieces. 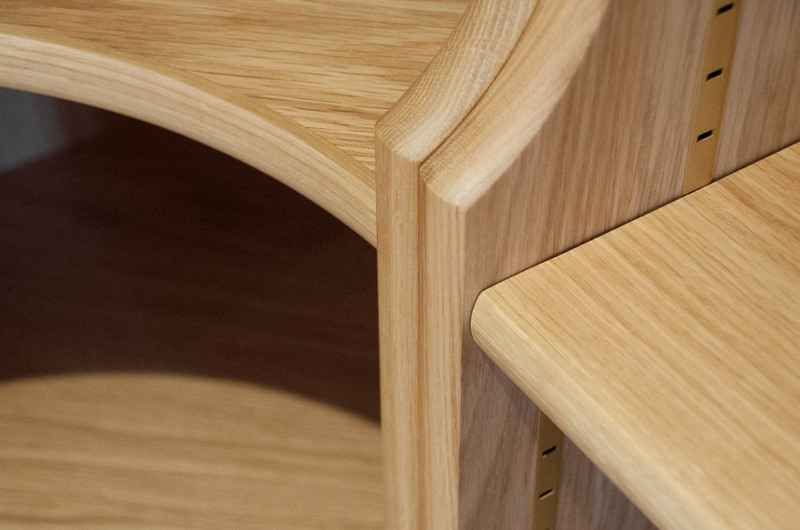 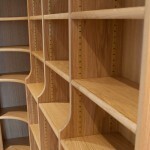 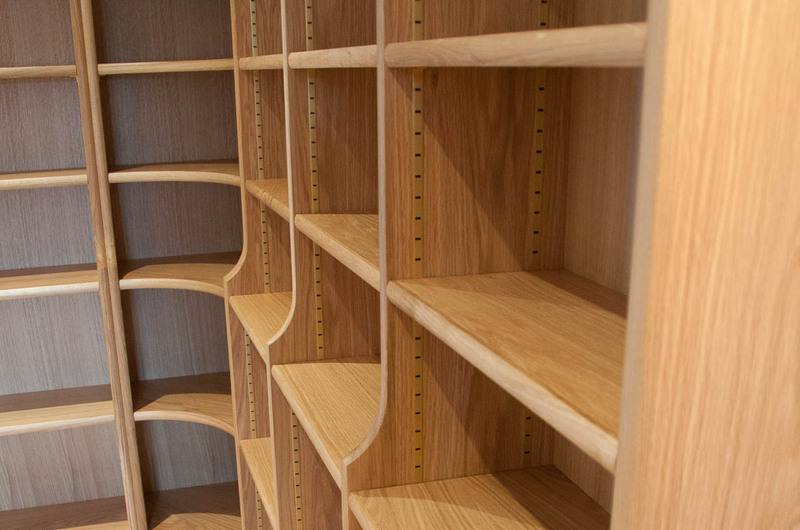 Our handmade bespoke bookcases are designed and tailored to your requirements. 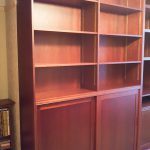 We make bookcases in many different styles and materials, built-in or freestanding, for the office and for home the study and the library. 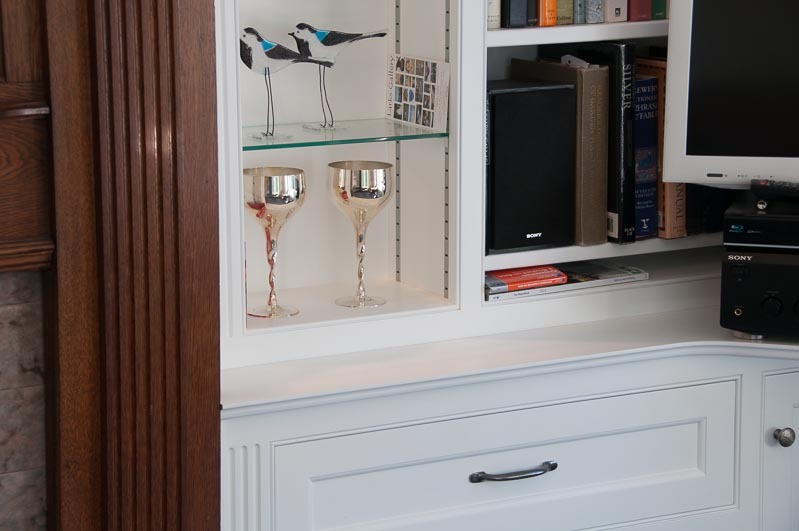 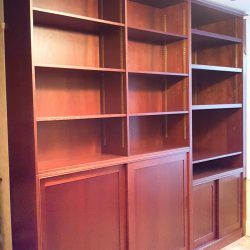 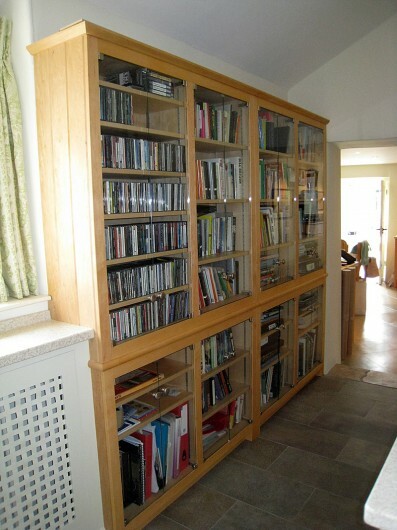 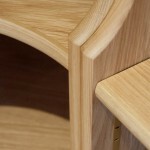 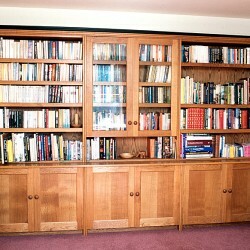 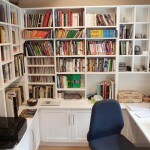 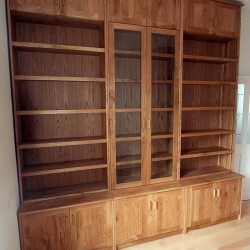 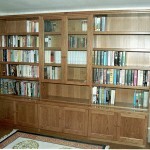 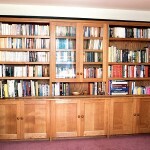 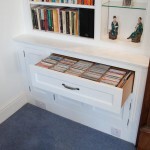 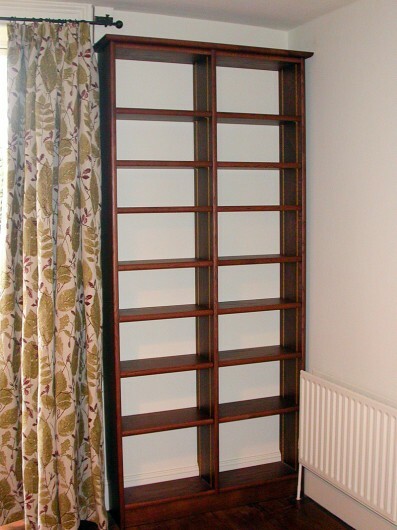 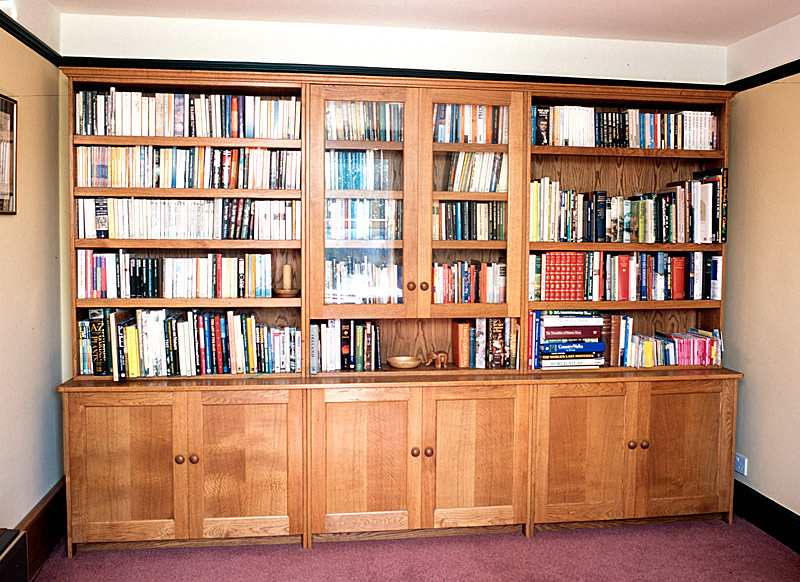 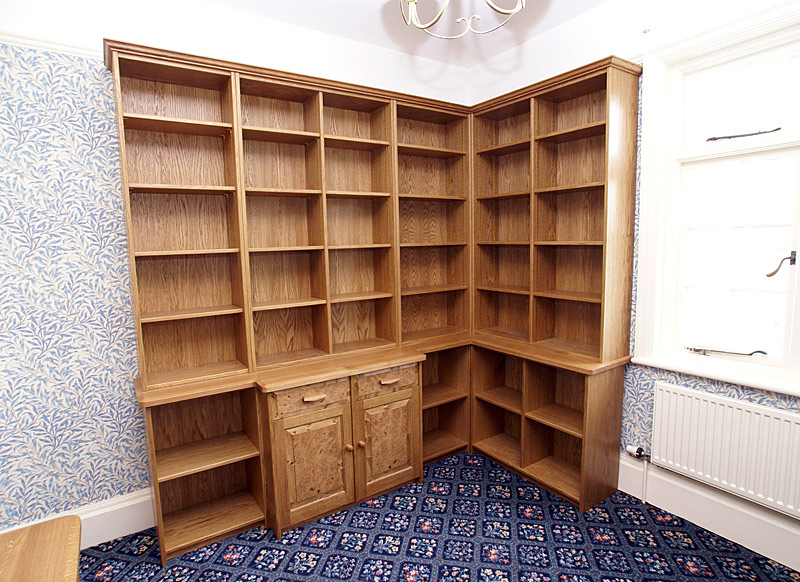 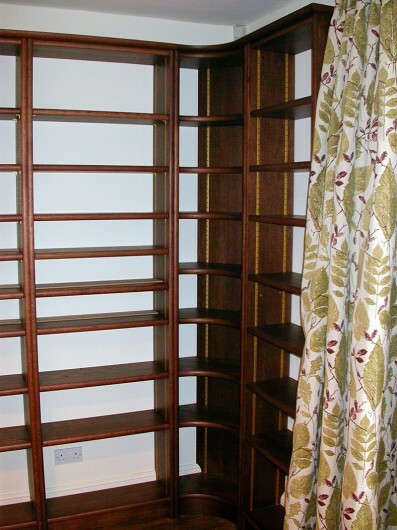 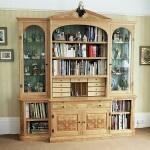 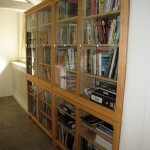 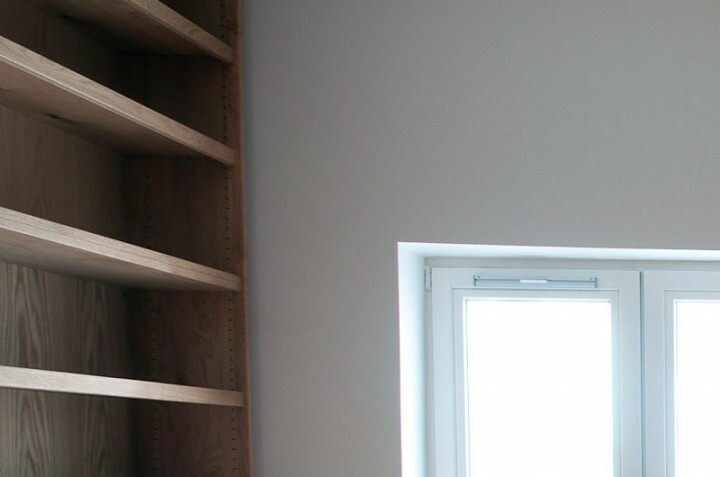 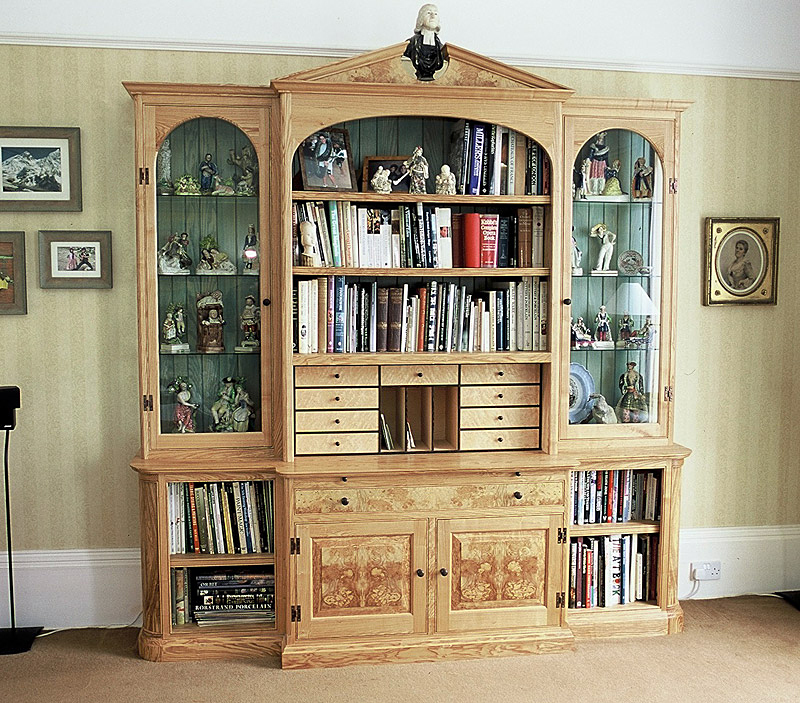 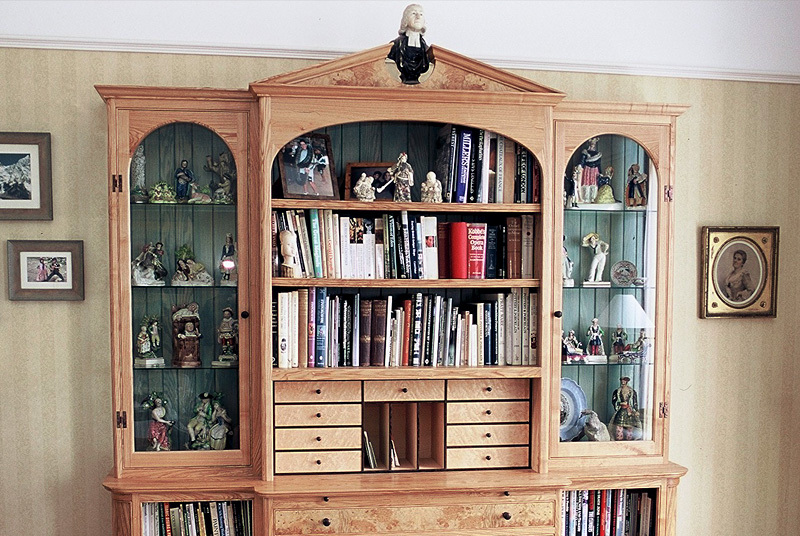 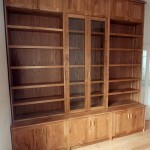 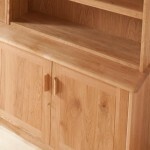 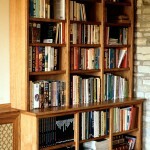 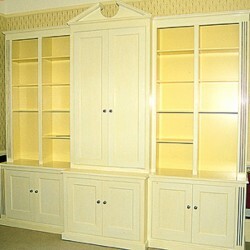 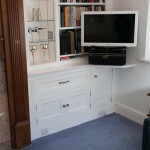 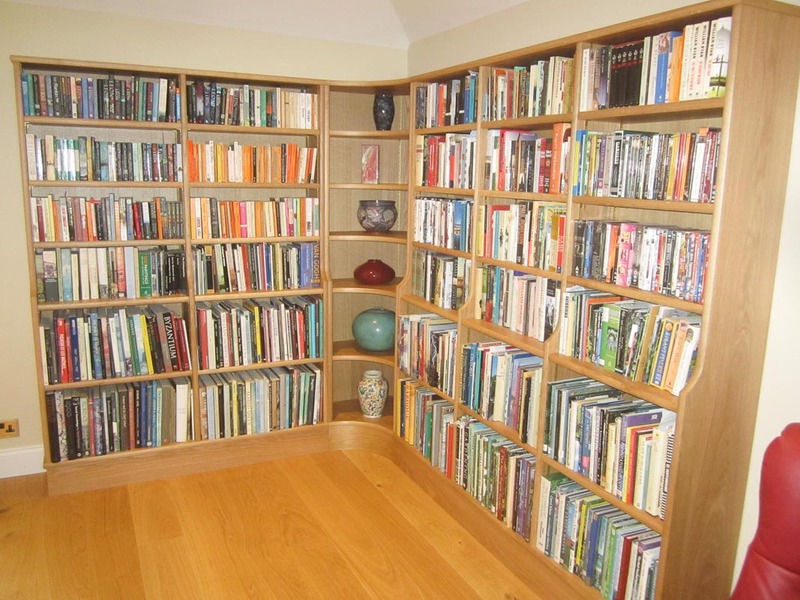 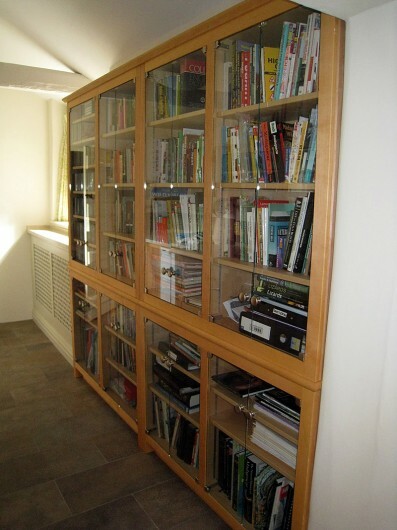 We make Breakfront bookcases, oak bookcases with glazed doors, drawers and display areas. 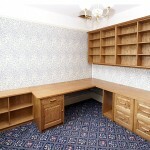 We can also incorporate plasma screens and media equipment as well as desks, computer equipment and filing. 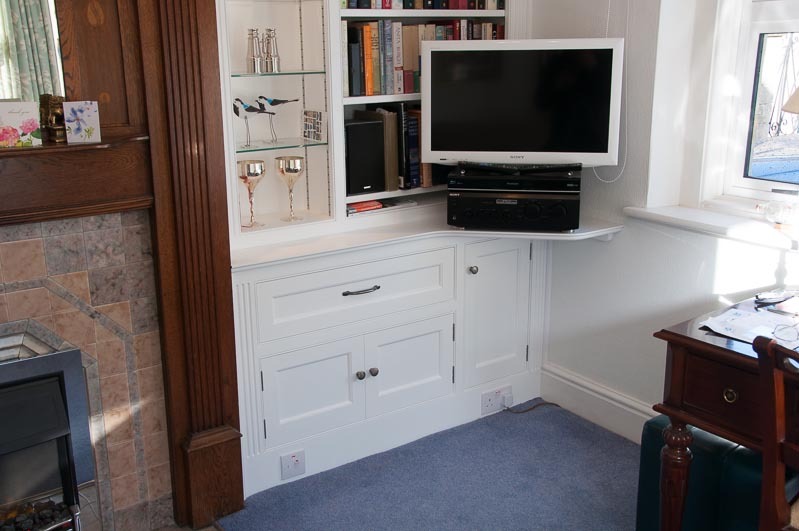 Aided by the very latest in computer design technology we are able to show you photo-realistic views of the furniture in situ, reassuring you that the design is right and giving you the ability to go ahead with confidence.